Pollen is a bee-product known for its medical properties from ancient times. In our days is increasingly used as health food supplement and especially as a tonic primarily with appeal to the elderly to ameliorate the effects of ageing. In order to evaluate the chemical composition and the biological activity of Greek pollen which has never been studied before, one sample with identified botanical origin from sixteen different common plant taxa of Greece has been evaluated. Three different extracts of the studied sample of Greek pollen, have been tested, in whether could induce proteasome activities in human fibroblasts. The water extract was found to induce a highly proteasome activity, showing interesting antioxidant properties. Due to this activity the aqueous extract was further subjected to chemical analysis and seven flavonoids have been isolated and identified by modern spectral means. From the methanolic extract, sugars, lipid acids, phenolic acids and their esters have been also identified, which mainly participate to the biosynthetic pathway of pollen phenolics. 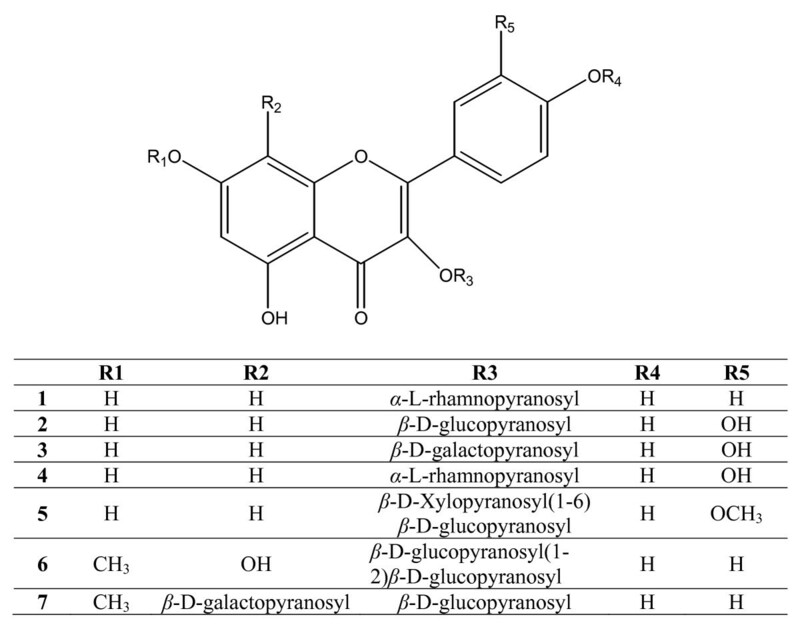 The total phenolics were estimated with the Folin-Ciocalteau reagent and the total antioxidant activity was determined by the DPPH method while the extracts and the isolated compounds were also tested for their antimicrobial activity by the dilution technique. The Greek pollen is rich in flavonoids and phenolic acids which indicate the observed free radical scavenging activity, the effects of pollen on human fibroblasts and the interesting antimicrobial profile. Bee pollen is a fine powder-like material produced by flowering plants pollen, mixed with nectar and bee secretions  and gathered by the honey-bees. Pollens are the male reproductive cells of flowers and bees' primary food source, containing concentrations of phytochemicals and nutrients and rich in secondary metabolites. During ancient times, people throughout the world used pollen for its medical properties as to alleviate or cure conditions such as colds, flu, ulcers, premature ageing, anemia, and colitis . In our days, is increasingly used as health food supplements and is currently marketed widely in Europe and Asia as a tonic primarily with appeal to the elderly to ameliorate the effects of ageing. Moreover, in many recent papers the chemical profile of different bee-pollens has been reported [3, 4]. It is known that bee pollen contains lipids, sugars, proteins, amino acids, vitamins, carotenoids, polyphenolics such as flavonoids and carbohydrates . Especially the carbohydrates are derived from the nectar with which the flower pollen has been mixed in the flowers. The phenolic composition of pollen principally consists of flavonol glycosides and of hydroxycinnamic acids . This composition tends to be species-specific [5–8] and has been related to the therapeutic properties (antibiotic, antineoplasic, antidiarrhoeic and antioxidant) of pollen [1, 7–9]. In order to evaluate the chemical composition as well as the biological activities of Greek pollen which has never been studied before, one sample with identified botanical origin of sixteen different common taxa of Greek flora has been investigated. The proteasome, a non-lysosomal threonine protease, is responsible for the turnover of both normal and damaged intracellular proteins. It has been suggested to serve as a secondary antioxidant mechanism . Once cells are challenged with oxidative stress, the proteasome is activated. It degrades oxidatively and otherwise damaged proteins, thus preventing the formation and accumulation of protein aggregates that in turn have additional deleterious side effects . This complex is critical for the maintenance of cellular viability and may be particularly important for the cell under various conditions of stress, during failure of homeostasis and senescence. It has been already shown that the proteolytic activities of the proteasome machinery decline during aging in several human tissues as well as in senescent primary cultures . On the other hand, the increased expression of proteasome catalytic subunits leads to increased levels of functional proteasome and in turn, in delay of the appearance of the senescence phenotype. Given the fundamental importance of proteasome function during aging, the aim of this study was to identify natural pollen extracts that induce proteasome activity. A Greek pollen sample was fractionated in three different polarity extracts and their possible proteasome activating properties were tested in human primary fibroblasts. It has been demonstrated that this pollen leads to stimulation of proteasome activities in human fibroblasts. In regard to the different polarity extracts, the water extract was mainly found to induce proteasome activity, thus revealing possible antioxidant properties. Due to this activity the aqueous extract was selected for further chemical analysis and seven flavonoids have been isolated. Sugars, fatty acids and also phenolic acid and their esters, which mainly participate to the biosynthetic pathway of pollen phenolics, have been also identified from the methanolic and dichloromethane extract. The structural elucidation was determined by modern spectral means 1D- & 2D-ΝΜR and by GC/MS after sample derivatization. The total phenolics were estimated with the Folin-Ciocalteau reagent and the antioxidant activity was determined by the DPPH method while the extracts due to their chemical consistency (rich in total phenolics) and the isolated compounds were also tested for their antimicrobial activity by the dilution technique against nine microbial strains. To the best of our knowledge neither Greek nor any other pollen has been tested before against human pathogenic bacteria and/or fungi. To our knowledge, this is the first report on the chemical analysis and biological activities of Greek pollen. The aqueous fractions of the studied pollen material have been shown to contain the flavonoid content of kaempferol 3-O-rhamnoside (1), quercetin 3-O-glucoside (2), quercetin 3-O-galactoside (3), quercetin 3-O-rhamnoside (4), isorhamnetin 3-O-xylosyl(1-6)glucoside (5), 7-O-methylherbacetin 3-O-sophoroside (6), and 7-O-methylherbacetin 3-O-glucosyl-8-O-galactoside (7) (Figure 1). It is noteworthy that all isolated flavonoids are flavonols 3-glycosides, which as a finding is in accordance with previous studies  where it has been proposed that such compounds have shown to act as essential stimulants of pollen tube growth in several flowering plants and as such appear to play a vital role in the plant fertilization process. The structures of the isolated flavonoids. A wide range of flavonoid types has been determined previously from pollen samples of different geographic origin among which mainly flavones , flavonols , dihydroflavonols and chalcones . Benzoic acid derivatives and hydroxycinnamic acids have been also identified from pollen . Flavonoids are widely recognised as reliable chemotaxonomic markers not only of plants but also of bee pollen and honey. The flavonoids in pollen and honey give special information of geographic and botanical origin of the samples [6, 17] as the flavonoid pattern of each pollen differentiates, in comparison with pollen originality. It is interesting that Cistus bee-pollen contains a large number of flavonoids while other pollens previously analysed contained much fewer . Thus, from almond bee-pollen only methoxykaempferol, quercetin and kaempferol 3-sophorosides were detected  while rosemary bee-pollen contained only quercetin and kaempferol 3-sophorosides . These very distinctive flavonoid patterns support the use of flavonoid analysis in the studies of the botanical origin of bee pollen . Concerning the studied sample, its microscopical analysis has been resulted to the following 16 different common taxa of the Greek Flora: Papaver rhoeas, Chamomila recutita, Sinapis arvensis, Cistus sp., Trifolium sp., Dorycnium sp., Cichorium sp., Convolvulus sp., Circium sp., Malva sylvestris, Fumaria sp., Eucalyptus camaldulensis, Anemone sp., Ononis sp., Asphodelus sp. and Quercus ilex. As the Greek studied pollen is a complicated mixture of pellets from sixteen common spring flowering plants, no further correlation between floral origin and structures of isolated compounds can be given. The methanolic extract was rich in sugars, as well as in fatty acids, fatty acid esters, phenolic acids (p-coumaric acid, ferulic acid, their glycerol esters and glycerol ester of caffeic acid) while the dichloromethane extract afforded fatty acids as linoleic acid, palmitic acid, methyl malonic acid and benzoic acid; fatty acid esters as palmitic acid methyl ester, linoleic acid methyl ester, linolenic acid methyl ester, linolenic acid ethyl ester, stearic acid methyl ester, arachidic acid methyl ester, behenic acid methyl ester, as well as methyl palmitate. According to literature data, it seems that, in general, the dominant fatty acids present in pollens are: palmitic (C-16), oleic (C-18:1), linoleic (C-18:2) and linolenic (C-18:3) acid [4, 20]. Pollen varies in the relative proportions of fatty acids as well as in their diversity [20, 21]. Fatty acids are important in the reproduction, development, and nutrition of honeybees [20, 22]. Certain fatty acids, such as linoleic, linolenic, myristic and lauric acids, have bactericidal and antifungal properties that are important for colony hygiene [20, 23]. The methanolic extract after derivatization was analyzed through GC-MS and it was found rich in sugars, as well as in fatty acids, fatty acid esters, phenolic acids (p-coumaric acid, ferulic acid, their glycerol esters and glycerol ester of caffeic acid). The sugar content of pollen has been also investigated and the presence of a high content of mannitol as well as of glucose, sucrose and fructose has been reported in accordance with previous studies . Given that only very few natural compounds and extracts have been shown to activate the proteasome [25, 26], we examined the effect of pollen extracts on proteasome activity. 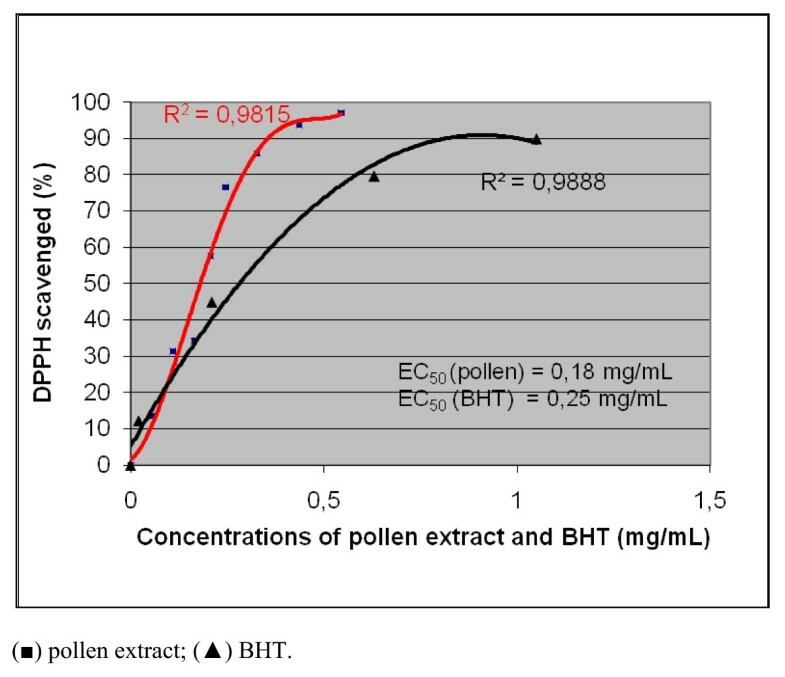 HFL-1 cells were treated with different concentrations of the pollen extracts ranging from 0.5 to 10 μg/ml for 24 h and the CT-L proteasome activity was measured (Figure 2). The aqueous extract exhibited proteasome stimulatory properties. More specifically, CT-L proteasome activity was increased from 1.8 to 2.2 folds at the effective concentrations of 0.5 and 2 μg/ml. Moreover we have also detected enhanced protein expression levels of β2 and β5 representative proteasome subunits in HFL-1 cells treated with 0.5 μg/ml of aqueous extract for 24 h as compared to the H2O - treated cultures (control) (Figure 3). The stimulation of proteasome activity by 1.8-2.2 fold is a biologically significant increase that has been shown before by other natural compounds with proteasome activating properties . The effects of such activation are significant given that a ~2 fold proteasome activation has been shown to confer cytoprotective effects to human fibroblasts against oxidative stress and to extend their cellular lifespan . Levels of CT-L proteasome activity. 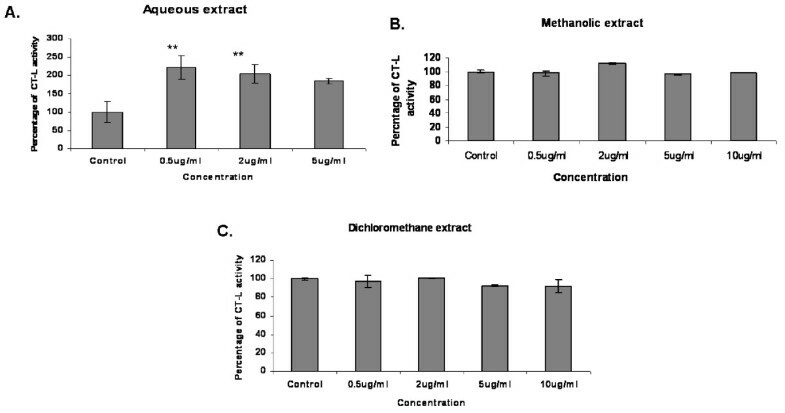 Percentage of CT-L proteasome activity in young HFL-1 cells treated with different concentrations of (A) aqueous, (B) methanolic and (C) dichloromethane extract of pollen for 24 h. Use of proteasome inhibitor (MG132) in control reactions ensured the specificity of the enzymatic reaction. Activities in control cells were arbitrary set to 100%. Proteasome activation by the aqueous extract of pollen. Immunoblot analysis of the representative proteasome subunits in HFL-1 cells treated with 0.5 μg/ml of the aqueous extract of pollen for 24 h. GAPDH levels were used as loading control. We then further examined which fraction of the aqueous extract is responsible for the observed proteasome activation. More specifically, the initial aqueous fraction was further fractionated in aqueous and methanolic fractions. HFL-1 cells were then treated with different concentrations of these fractions ranging from 0,5 to 10 μg/ml for 24 h and the CT-L proteasome activity was measured (Figure 4). Cell treatment with 0.5 and 2 μg/ml of the methanolic fraction for 24 h induced the CT-L proteasome activity (Figure 4A) while the aqueous fraction did not promote a similar activation (Figure 4B). Proteasome activation by the methanolic fraction of the aqueous extract fractionation. Percentage of CT-L proteasome activity in young HFL-1 cells treated with different concentrations of (A) the methanol and (B) the aqueous extract of the aqueous fraction for 24 h. Use of proteasome inhibitor (MG132) in control reactions ensured the specificity of the enzymatic reaction. Activities in control cells were arbitrary set to 100%. Total phenolic compound contents of the methanolic extract was found at the value of 10.49 ± 0.3 mg of protocatechuic acid equivalents per gram of pollen which is a value generally lower compared to pollen from Brazil or Arizona [1, 9]. That the flavonoid/phenolic components must play a significant role in the free radical capacity scavenging of bee pollen is indicated by the observation that the pollens which exhibit the highest activity are those that contain the highest level of flavonoids and phenolic acid derivatives . The free radical scavenging activity of the methanolic fraction of the Greek pollen aqueous extract was determined at various pollen extract concentrations and expressed as EC50 value. BHT, a well known food additive antioxidant (E321)  was used as standard (Figure 5). The EC50 value calculated for the extract was 181.4 ± 1.7 μg/mL and is comparable to values acquired for several types of pollen [1, 8, 9]. Specifically, Greek pollen was found to be about 10-fold more active than Brazilian pollen  but it was found to vary between slightly less active to almost 10-fold less active compared to bee pollen from several Arizona plants . It also showed 10-fold to 30-fold lower antiradical activity than bee pollen from Mexico . Effect of the concentration of pollen methanol extract and the standard antioxidant BHT on DPPH radical scavenging. Final DPPH concentration was 66.7 μM in all reaction mixtures. The extracts of the studied Greek pollen as well as the isolated flavonoids were evaluated for their antimicrobial activity against six Gram-negative and -positive bacterial strains and three human-pathogenic fungi. The results of these tests (Table 1) showed that the dichloromethane extract expressed a very weak activity while the methanol and aqueous extracts showed an interesting antibacterial activity especially against Gram positive bacteria (MIC values 0.50-0.80 mg/ml), and a weaker antifungal activity (MIC values 3.00 - 5.95 mg/ml). The assayed isolated flavonoids showed a comparable antimicrobial profile, with strong activity against Gram-positive bacteria. E. coli, appeared as the most resistant of all assayed bacterial strains for all tested extracts and isolated compounds. The expressed activity of both methanolic and water pollen extracts could be attributed mainly to the high content of flavonoids such as quercetin and kaempferol glucosides which are known to possess antibacterial activity . Moreover, according to literature data, pollen extracts have been assayed very rarely for their antimicrobial activity especially against human pathogenic bacteria and fungi. Among the reported studies, the extract of one Turkish bee-pollen has been reported to possess strong antibacterial activity against plant pathogenic bacteria  and a very weaker one against food-related microorganisms . Antimicrobial activities (MIC mg/ml) of pollen extracts and their isolated compounds. Bee pollen was collected from the area of Peloponnesus by the end of April 2006 and it was studied microscopically before extraction and analysis. Bee pollen (1 kg) was extracted with solvents of increasing polarities and the extracts were concentrated under reduced pressure to give 6.8 g CH2Cl2 extract, 301.6 g MeOH extract and 244.3 g H2O extract, respectively. The CH2Cl2 extract was chromatographed through GC-MS to afford fatty acids as linoleic acid, palmitic acid, methyl malonic acid and benzoic acid; fatty acid esters as palmitic acid methyl ester, linoleic acid methyl ester, linolenic acid methyl ester, linolenic acid ethyl ester, stearic acid methyl ester, arachidic acid methyl ester, behenic acid methyl ester and methyl palmitate. An aliquot (2 μL) of the sample was injected into the gas chromatograph at a split ratio 1:20. The GC-MS analysis was performed using a Hewlett Packard 6890 series II gas chromatograph equipped with an HP-5 capillary column (30 m, 0.25 mm i.d., 0.25 μm film thickness) and a mass spectrometer 5973 of the same company which was operated on EI mode. Helium was the carrier gas at a flow rate of 1 ml/min. For the dichloromethane extract the injector was operated at 200°C and the oven temperature was programmed as follows: 60°C for 5 min, then gradually increased to 280°C with a 3°C/min rate. The identification of the compounds was based on comparison of their retention indices (RI), retention times (RT) and mass spectra with those from Wiley libraries spectra and literature data. The MeOH extract was derivatised and chromatographed through GC-MS. It appeared rich in fatty acids and their esters as well as in phenolic acids as cinnamic and ferulic acid and their esters. Furthermore, through this chemical procedure, the major sugars were also determined as D-fructose, sorbose, L-altrose, β-D-glucopyranose, α-D-glucopyranose, D-mannopyranose, D-glucitol, mannitol, melibiose, talose, sucrose, maltose and lactose. The H2O extract was separated through resin (Amberlite XAD-4) to the aqueous-aqueous fraction (aq-aq) and the aqueous-methanolic fraction (aq-meth). The aqueous-aqueous fraction (aq-aq) included the above mentioned sugars which were determined through derivatization procedure and GC-MS analysis. The aqueous-methanolic fraction (aq-meth) was subjected to MPLC (RP-18 Silica Merck) eluted with H2O/MeOH step gradient to afford 6 fractions (C1-C6). From these fractions through column chromatography on Sephadex LH-20 (Pharmacia) eluted with H2O/MeOH step gradient, and the following flavonoids have been isolated: kaempferol 3-O-rhamnoside (1, 2.7 mg), a mixture of quercetin 3-O-glucoside (2) and quercetin 3-O-galactoside (3) (2.9 mg), quercetin 3-O-rhamnoside (4, 4.3 mg), isorhamnetin 3-O-xylosyl(1-6)glucoside (5, 2.0 mg), 7-O-methylherbacetin 3-O-sophoroside (6, 19.5 mg), and 7-O-methylherbacetin 3-O-glucosyl-8-O-galactoside (7, 1.9 mg) (Figure 1). Their structures have been established by NMR spectra and by comparison with the literature. 1H NMR (400 MHz) and 13C NMR (50 MHz) data were recorded on a Bruker DRX-400 spectrometer and on a Bruker AC200 spectrometer, respectively (using TMS as an internal standard). COSY, HMQC, HMBC and NOESY (mixing time 950 ms) NMR data were performed using standard Bruker micro programs. The MeOH extract was derivatized prior to analysis. For this purpose, about 5 mg of the residue was mixed with 50 μL of dry pyridine and 75 μL of bis(trimethylsilyl)trifluoracetamide (BSTFA) and heated at 80°C for 20 min. The silylated extract was analyzed by GC-MS. An aliquot (2 μL) of the derivatized sample was injected into the gas chromatograph at a split ratio 1:20. The GC-MS analysis was performed using a Hewlett Packard 6890 series II gas chromatograph equipped with an HP-5 capillary column (30 m, 0.25 mm i.d., 0.25 μm film thickness) and a mass spectrometer 5973 of the same company which was operated on EI mode. Helium was the carrier gas at a flow rate of 1 ml/min. The injector was operated at 200°C and the oven temperature was programmed from 100 to 300°C at a rate of 5°C/min. The identification of the compounds was based on comparison of their retention indices (RI), retention times (RT) and mass spectra with those from Wiley libraries spectra and literature data. Antimicrobial activity of the extracts and the isolated compounds was determined using the agar dilution technique . For all assays, stock solutions of the tested extracts were prepared at 10 mg/ml. Serial dilutions of the stock solutions in broth medium (100 μl of Müller-Hinton broth or on Sabouraud broth for the fungi) were prepared in a microtiter plate (96 wells). Then 1 μl of the microbial suspension (the inoculum, in sterile distilled water) was added to each well. For each strain, the growth conditions and the sterility of the medium were checked and the plates were incubated as referred above. MICs were determined as the lowest concentrations preventing visible growth. Standard antibiotic netilmicin (at concentrations 4-88 μg/ml) was used in order to control the sensitivity of the tested bacteria, while 5-flucytocine and itraconazole (at concentrations 0.5-25 μg/ml) as control against the tested fungi. For each experiment, any pure solvent used was also applied as blind control. The experiments were repeated three times and the results were expressed as average values. A panel of microorganisms, including two Gram positive bacteria: Staphylococcus aureus (ATCC 25923) and S. epidermidis (ATCC 12228); four Gram negative bacteria: Escherichia coli (ATCC 25922), Enterobacter cloacae (ATCC 13047), Klebsiella pneumoniae (ATCC 13883) and Pseudomonas aeruginosa (ATCC 227853); as well as three pathogenic fungi: Candida albicans (ATCC 10231), C. tropicalis (ATCC 13801) and C. glabrata (ATCC 28838) were used. Standard antibiotics netilmicin and amphotericin B were used in order to control the tested bacteria and fungi. LLVY-AMC, MG132, as well as primary proteasomal antibodies against β2 (PW8145; 28 kDa) and β5 (PW8895; 23 kDa) subunits were purchased from BIOMOL. Primary antibody against GAPDH (sc25778; 37 kDa) and secondary antibodies were purchased from Santa Cruz Biotechnology. HFL-1 human embryonic fibroblasts were obtained by the European Collection of Cell Cultures and were maintained in Dulbecco's modified Eagle's medium (DMEΜ; Invitrogen) supplemented with 10% fetal bovine serum (v/v; Invitrogen), 2 mM glutamine, and 1% non-essential amino-acids (complete medium). HFL-1 cells were subcultured at 37°C, 5% CO2 and 95% humidity, were fed approximately 16 h prior to each assay and cell number was determined in duplicates using a Coulter Z2 counter (Beckman Coulter). HFL-1 cells were subcultured when they reached confluence at a split ratio 1:2. CT-L proteasome activity was assayed in crude extracts with the hydrolysis of fluorogenic peptide LLVY-AMC at 37°C for 30 min, as described previously . Proteasome activity was determined as the difference between the total activity of crude extracts and the remaining activity in the presence of 20 μM MG132. Fluorescence was measured using a VersaFluorTM fluorescence spectrophotometer (BioRad). Protein concentrations were determined using the Bradford method with bovine serum albumin (BSA) as standard. Cells were harvested at indicated time points, lysed in reducing Laemmli buffer and proteins were fractionated by sodium dodecyl sulfate-polyacrylamide gel electrophoresis (SDS-PAGE) according to standard procedures . Proteins were then transferred to nitrocellulose membranes for probing with appropriate antibodies. Secondary antibodies conjugated with horseradish peroxidase and enhanced chemiluminescence was used to detect the bound primary antibodies. 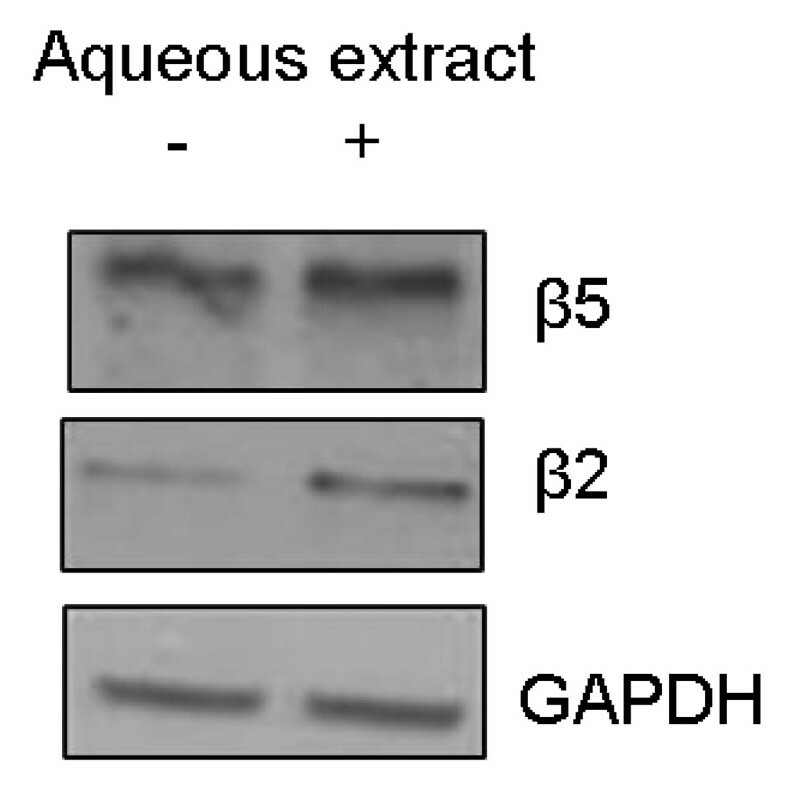 Equal protein loading was verified by reprobing each membrane with a GAPDH antibody. Statistics were performed by using Microsoft Excel software. Statistical significance was evaluated using the one-way analysis of variance (ANOVA). Results at p < 0.05 or p < 0.01 are denoted in graphs by a single (*) or double (**) asterisk, respectively. DPPH: (2,2-diphenyl-1-picryhydrazyl radical), PCA (protocatechuic acid) and Folin-Ciocalteau's phenol reagent were obtained from Sigma Chemicals Company Ltd. (St. Louis, USA) and sodium carbonate (Na2CO3) was from Merck Ltd, Darmstadt, Germany. Total antioxidant activity of the methanolic fraction of the aqueous extract and the standard antioxidant BHT was determined by estimation of the % radical scavenging activity by the DPPH test . An aliquot (50 μL) of the extract or the antioxidant standard solution in methanol, containing increasing amounts of antioxidants, was mixed with 1 mL of DPPH solution (70 μΜ in methanol). The kinetics of the decrease of the absorption at 515 nm was recorded in a glass cuvette (1 cm long), after the addition of the antioxidant solution against a methanol blank, until the reaction reached a plateau and the percentage of DPPH· remaining at the steady state was determined as a function of antioxidant concentration. The latter was used to determine the efficient concentration (EC50), that is, the concentration of pollen extract (mg of extract dry matter/mL) necessary to decrease the initial [DPPH·] by 50%. The blank sample consisted of methanol (1 mL) where 50 μL of the corresponding extract were added. The concentration of total polyphenols in the methanolic fraction of the pollen aqueous extract was estimated with the Folin-Ciocalteau reagent . The procedure consisted of dilution of an aliquot of the extract (up to 100 μL) with water to 600 μL and addition of 60 μL of Folin-Ciocalteau reagent. After 3 min, 120 μL of saturated (35%) Na2CO3 solution was added. The content was mixed and diluted to 1.2 mL with water. The absorbance was measured after 1 hour at 725 nm against a reagent blank. Protocatechuic acid (0-16 μg/1.2 mL) served as a standard for preparing the calibration curve. Results are expressed as the means ± SD of three replicates. The Greek pollen is very rich in flavonoids and phenolic acids as it has been shown in this study through the total phenolics as well as through the isolations procedure. This composition indicates the observed free radical scavenging activity and the effects of pollen on human fibroblasts and provides new insights towards enhancement of cellular antioxidant mechanisms by natural products as bee-pollen. Moreover, the interesting antimicrobial profile especially against Gram positive strains together with the other beneficial effects of Greek pollen, which is successfully introduced as a food supplement and can be easily up-taken through normal diet, could ameliorate the effects of ageing and well-being. Especially this latter mechanism, it has to be given careful consideration in the future through further scientific research. The authors wish to thank Dr S. Karabournioti (Director of the Chemical and Analytical Laboratory of "Attiki" Bee-Culturing Company) for the pollen analysis of our pollen sample. KG carried out the chemical analysis-structure elucidation and drafted the manuscript; SK carried out the measurement of proteasome activation; NA assisted to the chemical structure determination; GS carried out the determination of total phenolics and the measurement of radical scavenging activity; NC participated in the proteasome activation study; EG participated in the design of the proteasome activation study; IC conceived of the study and its design and coordination of the scientific teams, carried out the antimicrobial tests and assisted to draft the manuscript.